Reads piping geometry, section and material properties from 3D Plant Design system. Can include different pipes to carry out stress check. 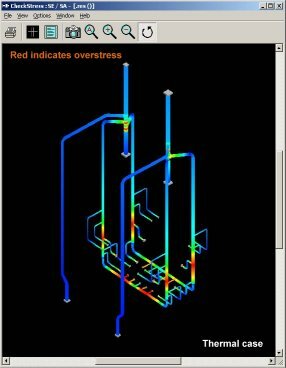 Uses temperature and pressure assigned for piping from 3D Plant Design system to perform stress analysis. Reads pipe support details from 3D Plant Design system and creates Supports, Hangers, Guides, etc. in checkSTRESS. 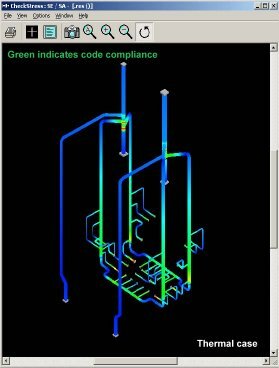 Enables piping code compliance by displaying stress ratio contour plots for Sustained (weight + pressure) and Expansion load cases. 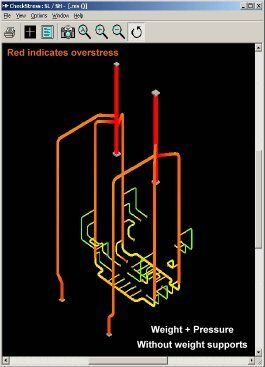 Assists in locating hangers and supports by showing deflected shapes for Sustained, Operating and Expansion load cases. CAESAR-II input file generation is optional.